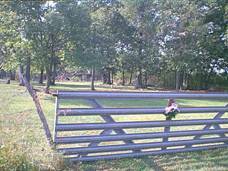 Note: This cemetery has been erroneously called “Joe Haney Farm” since the 1980’s and many sources continue to use this incorrect name. From Butler, go south on US Highway 71 to Missouri Highway 52 east, turn left (east) and go for 9 ¼ miles to County Highway O, turn right (south) and go for just over three miles to a private gravel road, turn right (west) and go ¼ mile. The cemetery is on the south side of the road. The road dead ends at a private residence. 11-12-13-Three rock markers in row. 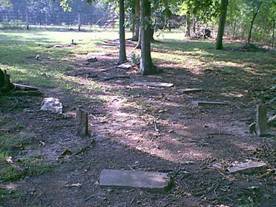 DeWeese Cemetery was formally established in 1880 when Clara Ellen DeWeese gave the land to the county for a public burying ground. Shortly after that, she married S.L. Wallace on March 17, 1881. The DeWeese family settled in and around Pleasant Gap. Jesse and Malvina Berhtol DeWeese came from Kentucky and settled in Bates County in the 1840’s. Their first child was Rosannah, born November 23, 1844 in Bates County who would marry Joseph Wix.